Photo by JoyD from a previous post on glasses. NICE: I am still wearing my J.F.Rey (made in France) red frames that are about five years old; but not for long. I have always been rather conservative about my glasses and since the cost of my lenses are astronomical, around 600 Euro or 900 Canadian, I think I need to be. Since being introduced to the Parasite frames in 2012, I have dreamt of splurging on a pair. Photo Source: Zenka, July, 2014. The day came. I went to the opticien, Optique Martin on Rue République in Ste. 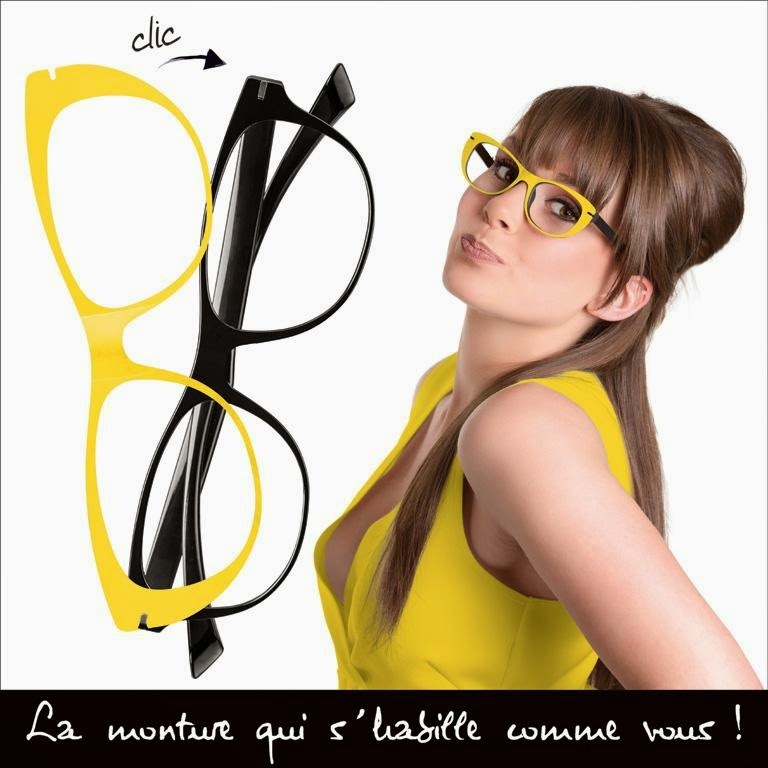 Foy La Grande in the Gironde, picked out my frames and then was introduced to another brand. 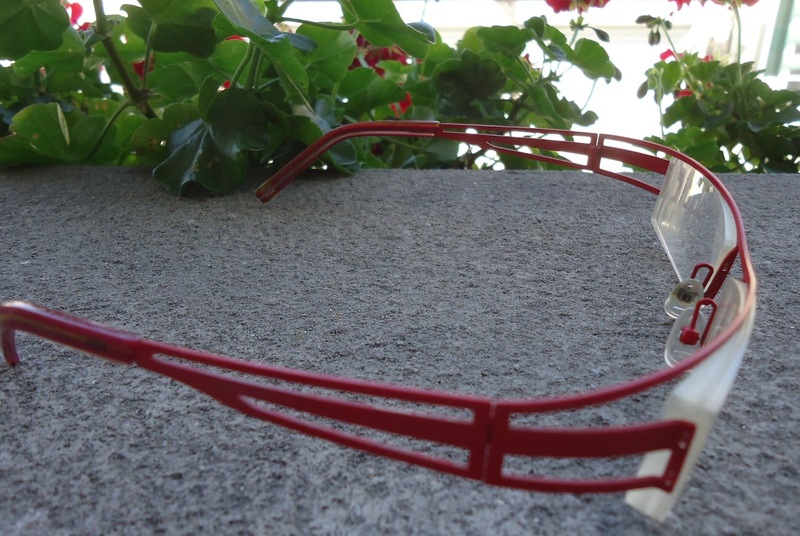 Zenka are also made in France and allow me to add colour "clips" to change the look of the frames so that my glasses become an accessory rather than a functional medical requirement. So now what do I do? The Parasite nags the artistic, almost eccentric, side of me; while the Zenka are basic and practical with the option of being artistic and eccentric. Zenka may win out . . . 24 hours later, I was back to see Anthony at Optique Martin to order the Zenka frames, in a tan base, with two clips, a white "netted" openwork style and a thin black outline. A blue clip will be my next choice; however there are acid green, fuschia, violet, red, grey and a variety of blue and turquoise tones to contend with. Oh . . . la . la . la la . . .
NOTE-WORTHY: Interesting tax consideration in France. Whereas in other European countries, the 20% VAT is only on the frames with a lesser tax amount on the lenses, wouldn't you know it, in France it's 20% on both frames and lenses. So what's a Canadian girl to do but ask if she can get a tax back form? Anthony was very accommodating and so my frames and lenses will come to me at 20% less (but not without a customs check and official stamps at the airport when I leave in December). Wah-ooo! You will have to check back in a week or so for an update to this post, when I have photos taken of my new Zenka frames. In the meantime you can visit the Zenka site to see what they have to offer. NEED: I still need a pair of Parasite frames; perhaps next year as sunglasses . . .
WOW! Both pairs are awesome but I like the concept behind the Zenka frames. Having the option to buy one quality designer pair of glasses but customize them with the coloured clip-ons. Makes good $$$ sense. I can't wait to see the post for these new frames. This is the same concept with my Tory Burch belts. One buckle on a reversible belt equals 2 options. Then another buckle on a different coloured belt. It all adds up to 8 different options. Brilliant! Thanks for sharing. Can't wait to see them. And merci for you comment. We obviously think alike in that the Zenkas are a better option, Not only am I getting my tax back but the optical exam was free. The optical dispenser was also an optician. Compared to my Canadian exam, the French one was way more high tech and took less time. Curious.